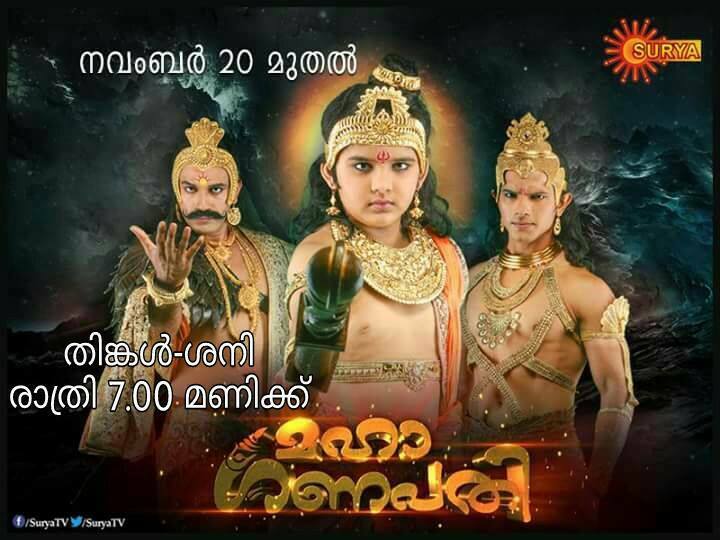 Surya tv announced the launch of latest dubbed serial mahaganapati, monday 20th november 2017 at 7.00 p.m. As mentioned earlier this is the malayalam dubbed version of sony tv serial vighnaharta ganesha. There may be some changes in surya tv prime time schedule, you can check the updated time of serials and shows from here. surya tv now contest at second place at barc malayalam rating charts. surya tv planning to bring more shows , they have recently purchased satellite rights of Punyalan Private Limited. Vaalsalyam, Mahaveera Hanuman, Ennu Swantham Jaani, Nagakanyaka Season 2, Shaneeswaran, Nandini, Ayalathe Sundari, Premam etc presently showing on surya tv. Mahaganapati telling the story of lord ganesh, you can watch unknown facts about ganesh through this serial. Uzair Basar is playing the title role in this tv serial, he is playing the role of Lord Ganesha. Akanksha Puri is another actor appearing in maha ganapathy, she is playing the roles of Parvati/Durga/Sati in this malayalam tv serial. Lord Shiva role is played by malkhan singh and some other actors appearing in maha ganapathy. Tushar Chawla, Basant Bhatt, Meer Ali, Anand Goradia, Rahul Sharma, Preetika Chauhan, Chirag Jani etc rest in cast.